The director of LG Mobile France Cathy Robin finally shed some light on why there exist such severe shortages for the Google Nexus 4 in all places, and shipments finish immediately after they go for sale. It turns out that Google gave LG sales forecasts that were based on previous Nexus phone sales figures, which turned out to be significantly underestimating the actual demand. That's why LG redirected much fewer resources to the Nexus 4 production project beforehand, and is now struggling to catch up with all the orders. It is not hard to deduce that Google has been conservative in its sales estimates, despite the predictable excitement that the price point for a top-notch handset immediately brought. The LG exec denied again the rumors of restricted Nexus 4 production, claiming the contrary - that LG is actually running the conveyor belts overtime now, and by mid-February there should be "no more pressure" on the Nexus 4 supply. That is a month from now, so all that is left for us is to sit back and wait while LG and Google tread the uncharted production waters, while Cathy Robin reiterated that this little demand forecast incident hasn't strained its relationship with Google, and things between the two are going "very well." She also said that the rumored 375,000 units sold figure is much lower in reality. On the price point, the LG exec said that the company is not selling the handset at a loss, but there is an internal agreement with Google to provide the Nexus 4 at a very attractive tag, perhaps in exchange for getting its foot in the Nexus family door. The Optimus G was also mentioned, with the intent for the current flagship to go on sale in Europe soon, perhaps in sync with the MWC expo next month. As per niche handsets like the Optimus Vu II, the company has no plans to offer these to the Europeans, and is also cautious about Windows Phone 8 for now. Maybe that's because Google previously gave too little bandwidth for nexus site? sounds like the same thing the lumia 920 went through at first. although LG is a bigger company than nokia so they should be able to get their production up faster. What does this mean? GG and LG are working without a contract? I don't know why GG just can't say they intentionally limit the N4 sales on Play Store? a month later the cost of N4 comes down so GG can afford to sell more as the subsidy will not be as big as it is. The technology in the N4 is superior enough to be future proof for at least two more years, and in that two years you'll be getting all the updates from Google, something a lot of Android phones can't claim. And good luck finding a phone of this quality at the same price point. I've owned three of the four Nexus phones and can say with all confidence, this phone is the best yet and worth waiting a few weeks for. That's completely believable. They are companies, there is nothing in the Nexus history to forecast this phone being a bigger hit than previous models. Especially with American's so ingrained with carrier contracts. Despite the value of the phone, there is no real concrete evidence to believe this phone would have been any more popular than the ones that came before it. With that being said...as a manufacturer, if your buyer says I need this may phones, well that's how many you make. You have your whole supply chain set up for that quantity with a small buffer to ram up or down. Not the magnitude the Nexus 4 has demanded. Again, many companies get bit by over-estimating sales. It's bad for business and there was no way they were going to go out on a limb and just produce a whole bunch more than forecasts required. The specs of previous Nexus devices have always been ordinary. This time they went up market with class leading hardware - and sold at a price point that was $3-400 less than others in the same league. I say "build it and they will come".. Well they built a great phone at a great price, and they did come. Keep doing it Google. Cheap phones with awesome hardware will always sell - its not always about whether its iOS or Android. A lot of my friends sold their iPhone 5's and had enough $ to buy an N4 and N10 as they were great value for $ as well as having the specs to back them up! It didnt ring a bell that a Nexus worth half of the price with better specs would sell much better than previous models? Thats kind of dumb. Im just saying. Theyre losing a lot more customers now. It was all about timing when the device was released. 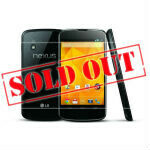 When Nexus 4 came out, only quad-core device on the market was Note II and the price range was incomparable. Although most of the cellphone users are still dumb, a lot of smartphone users are getting smarter about their options, and knew Nexus 4 was too good to be true. The fact that LG or Google didn't forecast this to happen is exactly why they're not #1 manufacturer in the cellphone market. so will the phone be available through the play store mid-feb? Or will they be caught up with the back orders? Was going to buy a nexus 4 till the sony xperia z got announced, same specs and the xperia z has better features like micro sd, your loss google/LG. It is good to under estimate IMO. In this case...they under estimated a lil too much...lol. I am in Vietnam, LG is selling the nexus 4 at 550$. We can buy as many as we want. That means there is no manufacturing issue. Just price, I guess.